Here goes another bake journal entry for a blog event, Sugar High Fridays (The brainchild of the Jennifer over at The Domestic Goddess who started this event way back in October 2004). 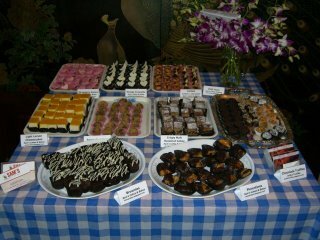 For Sugar High Fridays #24 or in short, SHF #24, hosted by Jeanne of Cook Sister!, the theme is: Petits Fours. 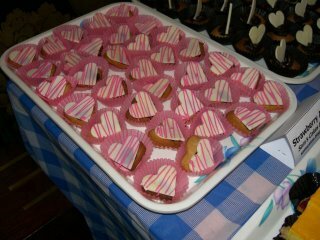 I decided to showcase one of the many petits fours that i did recently for my own 21st birthday celebrations - Strawberry Amores. 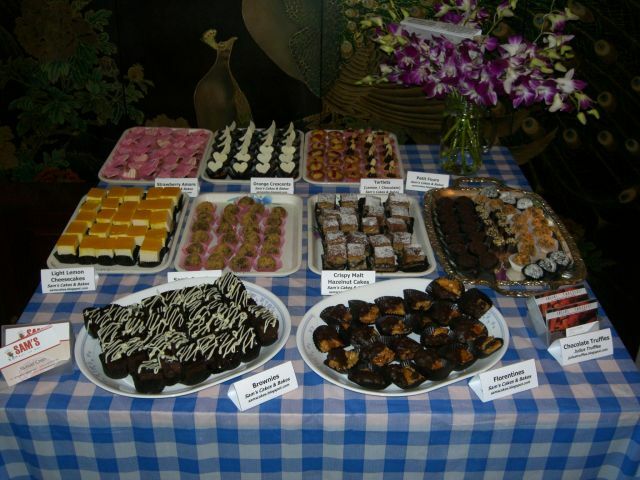 Petits Fours may look difficult to do at first, but with proper planning of your Mis En Place, it is indeed a joy to make and it gives me a great satisfaction to see my friends enjoy the petits fours. Strawberry Amores are simply made by assembling a heart-shaped cutout shortcrust pastry base, pipe some strawberry chocolate gananche and topped with a heart-shaped cutout white chocolate (with pink stripes). Complicated as it may sound, these Strawberry Amores are indeed great conversational topics during parties as your guests would be overwhelmed by the attractiveness of this petit four. Click Here for the Roundup. 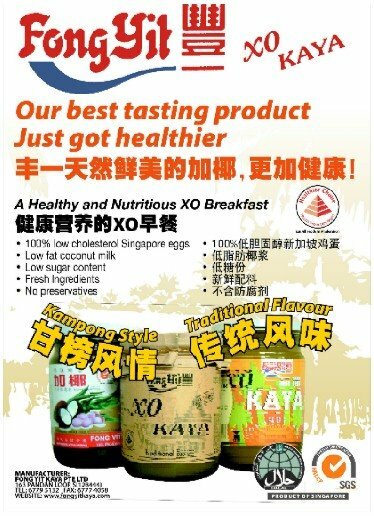 Baking Recipes using Fong Yit's XO Kaya! (Centre: XO Kaya Soya Flower Buns, Right: XO Kaya Almond Friands). 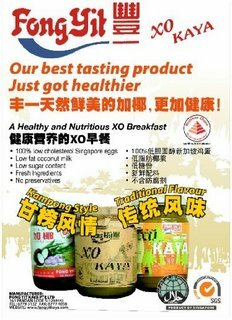 Besides all the health benefits, I must say Fong Yit's XO Kaya is also bakeable as you can see from the buns, the kaya is not burnt. 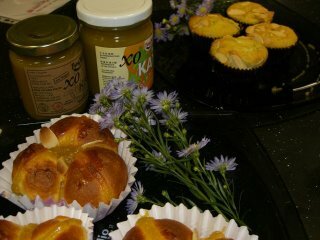 This is mainly due to the use of isomalt in this kaya instead of sugar which would caramelised and burnt. 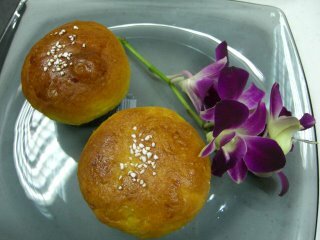 Since, previously I have shared with you all a bread recipe, I have decided to share a friand recipe this time round. What is a friand? Friands (French for "Little Cakes") are traditionally made mainly with nut-meal, usually Almond, melted butter and only a small measure of flour. In addition, friands usually use egg whites, which is low in cholesterol. You may think what a waste! How about the egg yolks? No fret, the 3 egg yolks that you have left, keep them in air tight containers in the fridge. 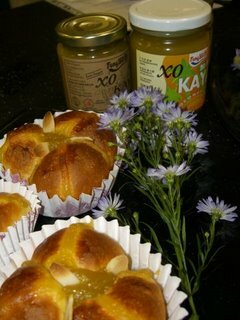 I promise to post a recipe that will use 3 egg yolks soon. Or else, one can always make french toast with them for breakfast! Here is the recipe... It is so easy! so healthy! 1. Preheat oven to 180C. Grease 6 muffin pans. 2. Cream butter, icing sugar and pandan essence till light & fluffy. 3. Whisk egg white till thick and foamy. 4. Combine creamed butter and whisked egg white. 5. Fold in sieved flour & grounded almond, stir until just combined. 6. 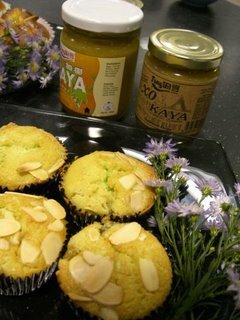 Divide half the mixture among prepared pans, fill with 1 tsp of chilled "XO Kaya" filling and divide the other half of the mixture into the prepared pans and topped with flaked almonds. 7. Bake at 180C for 25 to 30 minutes. 8. Serve with a little extra sifted icing sugar. Thanks to Angie's Blog (My Kitchen: My Laboratory), I got a chance to participate in this event, hosted by Zorra of Kochtopf. I am a fan of all breads and I hope to inspire more people to make their own bread. Through my short baking demonstrations, I try to introduce new flavours to our breads. Which brings me to the point of this blog entry... Eggless Pumpkin Buns. As I have already mentioned in my first Bake Journal entry, I am very proud of this bun, simply because it is nutritious (high in Vitamin A & Beta Carotene due to the Pumpkin) and Eggless (Low in Cholesterol), but yet it is still very soft!!!! (No bread improvers added!) For those people out there who shares the same passion for bread as much as I do, you should try out the recipe (First Bake Journal Entry). 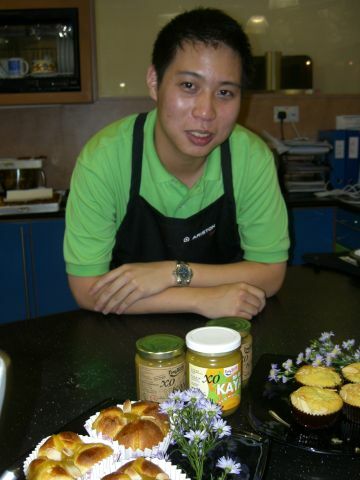 It has indeed be a joy for me to constantly develop new bread recipes and to share them in my baking demostrations. 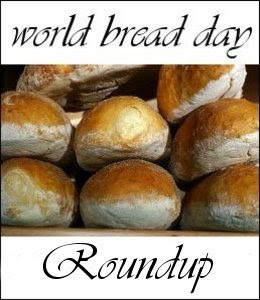 Now this sharing of new bread recipes have reached a new level, sharing with bread lovers around the world. There will be a round up of all the entries submitted to Zorra on 17th October. 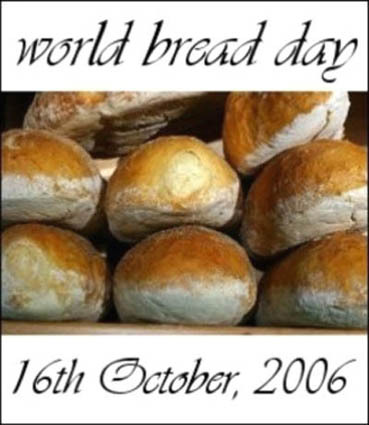 I look forward to see what my fellow bread lovers around the world would submit to Zorra on 17th October!